So your 11-year old son wants to buy a new truck. No problem. You head off to Toy Zone and choose one of those bright coloured plastic models. Not so if your name is Ruvic Waldeck who, instead of heading to the toy shop with his dad, phoned Paul Jooste, Brand Manager of Mercedes-Benz Commercial Vehicles East Rand to arrange a meeting. If ever there is a description which ideally suits 11 -year- old Ruvic Waldeck, this is it. This lad, the son of Rudolf and Vicky Waldeck who started, own and run SA Zero Waste, is a youngster who certainly is venturing into his own life and seeking his own independence. Why else would he have formed his own company, Mega Fleet (Pty) Ltd and have purchased a Mercedes-Benz Actros 2646 and interlink side-tipper trailer with an agreement to contract as a ‘subbie’ to his parent’s transport operation. 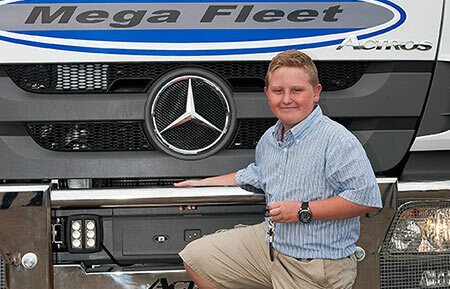 Ruvic Waldeck, the world’s youngest truck owner in the world’s company Mega Fleet will sub- contract to SA Zero Waste, which in returns sub-contracts to Imperial, on the same basis and conditions as any other sub-contractor would do. His contract will see his ring running between the Northern Cape and Durban.